The Rowdies got even younger this week with the official announcement of midfielders Jeff Michaud and Marquez Fernandez, defender Zac Portillos, and goalkeeper Chris Glodack as the latest additions to the 2015 roster. All four were participants in Tampa Bay’s invite only combine that took place on the final weekend in January. 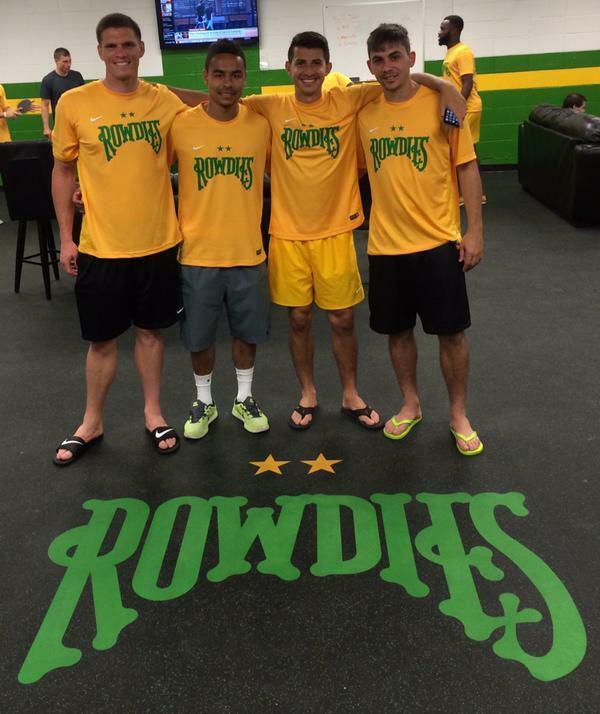 They are all also making their professional debuts with the Rowdies after developing in college soccer. The group also has some experience at the PDL level. Michaud played with the Schulz Academy (now Floridians FC), Fernandez with the Baltimore Bohemians, Portillos with the Des Moines Menace, and Glodcack with the IMG Academy team. Fernandez, 22, grew up in the Baltimore area and also spent his entire collegiate career there. He was a highly sought after high school recruit and was at the University of Maryland for his first two college years. A stress fracture in his freshman season lead to difficulty cementing a starting spot so he transferred to the University of Maryland-Baltimore County for his final two years. In his senior year UMBC made a surprising run in the College Cup national semifinals. Fernandez played primarily in defense in college, specifically center back, but coming out of high school was touted for his ability to get involved the attack and create opportunities for others. The Rowdies have him listed as a midfielder so it would be fair to assume that he will be a defensive, holding midfield option. But with so much time in preseason left don’t be surprised to also see Fernandez used on the back line considering his resume. Michaud, 21, grew up in West Palm Beach, FL and started off attending the University of Central Florida before moving on to Eastern Florida State College. Coming out of Dwyer high school UCF’s coach noted Michaud’s versatility to play anywhere in midfield and high work rate. In his senior year at Dwyer he notched 31 goals and 15 assists in 15 games. Time will tell how Rongen plans on implementing him into the system though. In the Rowdies preseason loss to Malmo FF Michaud was put on the left side of the field in a 4-3-3 formation in the second half. That half did not go well for the Rowdies, but the midfield showed some promising possession and a commitment to play the ball on the ground when Michaud was on the field. Portillos, 23, is a product of the University of Akron, a program known for producing a plethora of professional talent over the past decade. Portillos mostly played in midfield for the Akron Zips but the Rowdies have noted that he needed depth as a natural left back. Players switching positions when transitioning to the professional ranks is a fairly common practice, and depth at left back was certainly an area that needed to be addressed. Portillos played one half each in Tampa Bay’s games against Malmo FF and the Philadelphia Union, and showed well in both instances. Glodack, 21, is a four-year veteran of Clemson University where he helped win the 2014 ACC championship. In that championship run Glodack lead Clemson to two tournament wins in penalties. Glodack was born in Myrtle Beach, SC but can be added to the growing list of players with ties to Tampa Bay, having played high school soccer at the IMG Academy in Bradenton. The former Clemson Tiger played the full 90 in the Rowdies’ 4-0 loss to Malmo FF but was left out to dry on most those goals. Lackadaisical defending on set pieces cost the team two quick goals in the first half and a defensive miscommunication left a Malmo player with ample time to pick his spot from 6 yards out. The remaining goal perhaps could have been secured better by Glodack when he appeared to save the shift from the top of the box at first. Apart from that he showed aggression in the right moment to kill of Malmo counters and made an impressive save from a shot from about 30 yards out. Fans will take comfort in finally having another keeper officially on the roster after a rocky season for MLS veteran Matt Pickens. The Rowdies now have 23 players on the official public roster. The average age is now 26 years old. 5 of those players are 30 or older. 10 players are younger than 25. Farrukh Quraishi appears to have done a deft job finding a balance between veteran experience in key positions and raw talent for Thomas Rongen to mold into the type of players that can flourish in this new system.